I guess I could say that my odd multi-year correspondence with John Cale began because of a song on this album. In 1998 I worked for Jane's. I got a message that a customer was having trouble with a subscription to one of our email newsletters and the name was "Kale". I called, heard that delicious Welsh accent, and suddenly realized I was on the phone with the Velvet Underground legend, a guy whose name I knew how to spell correctly. Long story short: I was wise enough to not pepper him on that call with a bunch of VU-related comments. Instead, I mentioned some more obscure releases from his back-catalog, notably his Dylan Thomas-inspired album, Words For The Dying (1989). A few cuts from that release are spread out on Fragments Of A Rainy Season (1992), Cale's superb live album. That release is being prepped for a 2-CD reissue and that version is going to drop on Domino this Friday. Here's my take on this live album, more on my multi-year correspondence with Cale at a much later date. 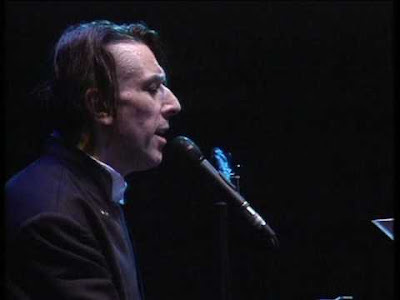 John Cale has always been an artist hard to pin down as a solo performer. He's flitted from classical to rock to new wave to torch songs and back again. His prodigious talents allow him this luxury and he usually makes those leaps look easy, his mastery of each form so complete that this genre-hopping has never seemed dilettantish. And perhaps the best, most basic way to understand Cale as an artist -- to grasp this Welsh gentleman's command of so many styles -- has been to dive into Fragments Of A Rainy Season. First released in 1992, the album gained attention for Cale's timeless interpretation of the late Leonard Cohen's "Hallelujah", or Cale's own tortured run at "Heartbreak Hotel", more horrific than anything the King could have ever imagined in a pill-haze. But more than as a showcase for those 2 incendiary covers, Fragments Of A Rainy Season works best as a career overview of this musical genius. Here, on this new edition, the work has been expanded, the bonus cuts thankfully removed to the second half of this set and the first live set largely intact. Tackling the Thomas material on the piano, the melodies of his compositions based around the poems "Do Not Go Gentle Into That Good Night" and "Lie Still, Sleep Becalmed" retain their radiance, the sharp angles of Cale's score plonked out by the Welshman himself. The material from Words For The Dying works on the keyboard, especially so if you know the orchestral versions of these cuts. Elsewhere, Cale tackles numbers from his older records on the guitar, "Guts" and "Ship of Fools" getting by on a good deal of Dylan-style appeal. "Style It Takes" from 1990's elegant Songs For Drella still sparkles like a ruby, while "I Keep A Close Watch" remains the most perfect Sinatra song never essayed by Frank himself. Mixed in among the bonus cuts are rough live stabs at the Velvet Underground nugget "Waiting for the Man" as well as "Antarctica Starts Here", which shines as one of Cale's absolutely best compositions in terms of tune and lyric. This new 2-CD set of Fragments Of A Rainy Season doesn't alter my opinion that the live album is one of Cale's most essential releases. Sure, the bonus tracks are nice to have but there was little worry that anything could diminish the perfect presentation of the original release. Still, the extra numbers expand the overall impact of this set, some of them showing a rougher Cale than those cuts on the original edition itself. Think of this as the shiny, simple distillation of Cale's genius now made shinier, more perfect, more direct, each piece adding to the overall effect. In some remarkable way, this is Cale's "best of" disc. I can imagine some kid today gorging on the first few Velvets' releases, then starting his Cale quest with this career-spanning disc much the same way I might have started on my education into Lou's solo stuff with Rock 'n' Roll Animal. But more than Lou's somewhat turgid release, John Cale's Fragments Of A Rainy Season is a dynamic live album, the finest set of solo Cale tunes one could possibly cull, performed by the man at arguably the height of his second, or third, career peak -- (he's had many). What I'm trying to say, man, is if you own some VU stuff and no Cale albums, start here, preferably with this new 2-CD version. The essential Fragments Of A Rainy Season from John Cale is out on Friday via Domino. Follow John Cale via his official website.